This might sound like a statement of the obvious, but no one plans an accident. There are some environments, however, where accidents are expected. While not exactly planned, there are some workplaces where people are not surprised when something happens that results in an injury or causes damage. They consider this kind of unpredictability normal. How does this happen? Bad habits are easily formed when there is a lack of training or a desire to cut corners or reduce immediate costs. Complacency about the practices and habits that cause unpredictability are probably causing more damage than you realize, embezzling resources that could and should be focused on improving and growing your company. When an accident or problem happens you have to deal with it. People get pulled away from their normal duties and onlookers get distracted. Repairs can take precedence over meeting customer needs. Administrative tasks to document and handle the disruption can be time consuming. Whether it’s the people who are involved or those responding, their time and energy gets diverted from doing the things that create revenue for the company. When unpredictability causes a delay in meeting customer needs, there could be extra costs in repairs, rework or measures that need to be taken to expedite production and delivery. Download "Top 5 Reasons IT is Unpredictable"
The cost of doing business automatically increases when an accident or problem disrupts your people and diverts their attention away from their normal duties. Who knows if a repair bill is going to be large or small and what extra costs you’re going to accrue because of damaged equipment or property? Sometimes cost cutting measures seem like the right thing to do, but they can be the cause of unpredictability and end up costing the company more in the long run. What is a risk but a threat to your business success. Disruptions to the work day, diversion of resources, and unexpected costs are not going to help any business succeed and so unpredictability is really causes its own set of business risks. So does the erosion of trust that results when people are hurt, stressed or have obstacles that thwart their performance. 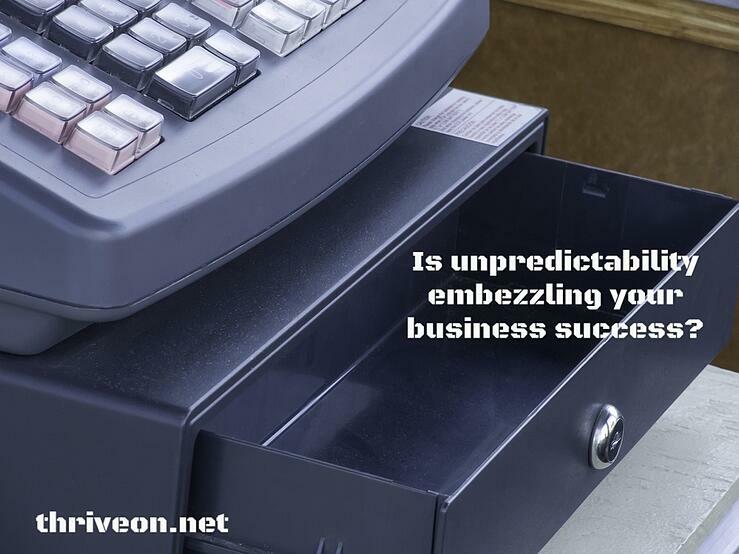 Unpredictability can also hurt your reputation and ability to get and keep customers. Repeated downtime and slowdowns cause disruptions in the work day. IT is consumed by responding to problems and issues, and people have to wait for help. Costs are unpredictable and planning is neglected. Hidden risks put business success in jeopardy. Thriveon’s approach to IT services is one that combines strategy and management and results in a predictable IT framework on which to leverage technology. If you are ready for IT to do more for your company, contact us to schedule a discovery meeting. Just call 855-767-2571 or give us your contact info and we’ll call you.